See step-by-step photos on the original Seasonal Chef post here. Holiday cooking: Ideas and recipes for Halloween. More recipes: great one-post meals. Cut the chicken in to 2” pieces, season with ½ teaspoon each of salt and pepper and set aside. 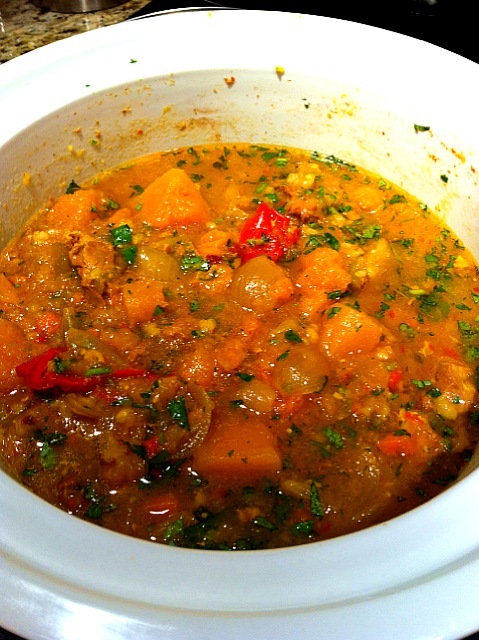 Place the celery, carrot, onion, pepper, garlic, tomatillo and tomatoes in a, 5 quart slow cooker and combine well with 1 teaspoon of salt and ½ teaspoon of pepper. Add the squash and chicken and mix everything together. In a large mixing bowl combine the chicken stock, chipotle, lime zest and juice and pour into the pot. Set on low heat for 8 hours. After it finishes cooking allow the stew to cool completely, if not eating right away, and place in refrigerator. Garnish with chopped cilantro before serving and check for seasoning. Reheat in the oven or microwave and serve over rice or egg noodles.